Wordy, I know. This journey of mine started when I was trying to figure out what to post next for the blog. I have this great caramelized banana bread recipe that I use and was going to blog about that. But right when I was about to start baking, I realized that banana bread recipes are a dime a dozen on the internet. Why would I bore you with something that has been done for the umpteenth time? No, I needed to do something different, maybe even drastic. That’s when I spotted a bag of caramel bits that I picked up at Target a few months ago and the cogs in my brain started turning. It starts with a soft caramelized banana cake. What makes it “caramelized” banana cake? Because you caramelize bananas with sugar and melted butter until it starts to smell like banana heaven in your kitchen. Then you mix your caramel bits into the batter to increase the caramel factor. Next, the cake layers are sandwiched with cheesecake frosting which is essentially my version of a cream cheese frosting only it is extra thick and tastes very much like cheesecake. 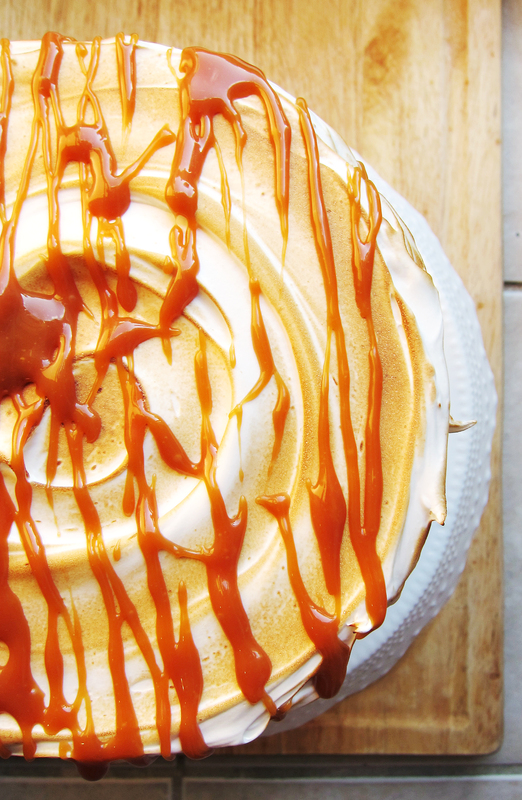 Then the entire cake is surrounded by marshmallow frosting which you toast with your kitchen torch (or in your oven if you don’t have one) and as if you really needed more, you finish it off with a caramel drizzle. Preheat oven to 350˚F and prepare four 6 inch cake pans by spraying them with non-stick spray and lining the bottom with parchment paper. In a small pot, melt the butter. Once the butter melts, add the brown sugar and bananas and cook for 4 minutes. Cool mixture for 10 minutes before transferring mixture into a bowl of a stand mixer fitted with a paddle attachment. Beat for 2-3 minutes until mixture is cool and combined. In a small bowl, whisk buttermilk, vegetable oil and eggs until homogeneous. In another bowl, mix both kinds of flour with baking soda, cinnamon and salt. With the mixer on low, add half the buttermilk mixture followed by half the flour mixture. Finish the batter by alternating the buttermilk mixture and flour mixture again. Fold in the caramel bits into the batter. Divide the batter evenly between 4 pans and bake about 12-15 minutes until a toothpick comes out clean. Let cool for 10 minutes in the pan and then remove from pan and let cool completely on a wire rack. In a standing mixer fitted with a paddle attachment, beat cream cheese and butter until combined. Add the powdered sugar slowly, followed by the mascarpone cheese, vanilla extract and kosher salt. Do not overbeat the mascarpone cheese it will separate if you do. In a metal bowl of a standing mixer, whisk egg whites, sugar and cream of tartar over a small saucepan with simmering water. Whisk until sugar is dissolved and whites are slightly foamy and warm to the touch, about 2-3 minutes. Transfer bowl to the standing mixer fitted with the whisk attachment and beat starting from low speed and gradually moving to high speed until stiff and glossy. Mix in the vanilla extract to finish the frosting. In a small saucepan, melt caramel bits with heavy cream until a thick sauce forms. If the sauce is too thick, feel free to add more heavy cream. 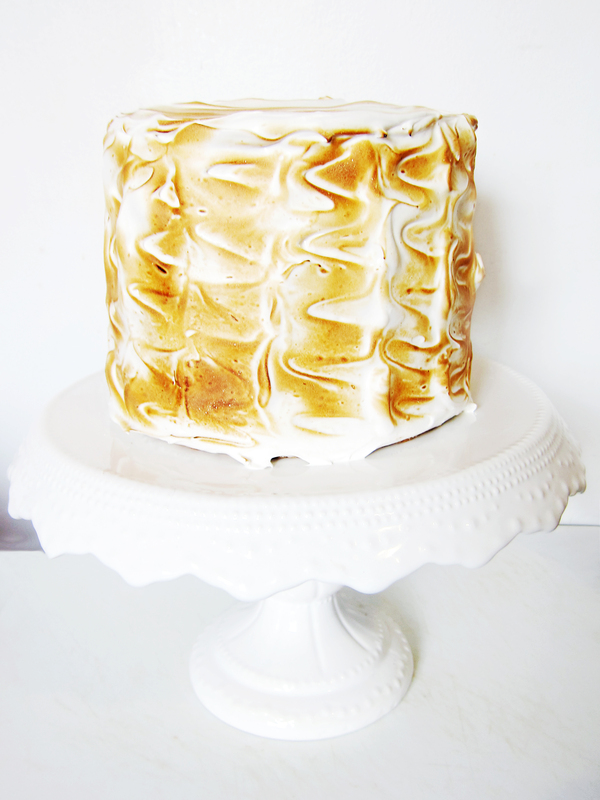 Generously frost the top and sides with marshmallow frosting using your spatula to make swirl patterns along the cake. This will make a more impressive cake when you toast the frosting. 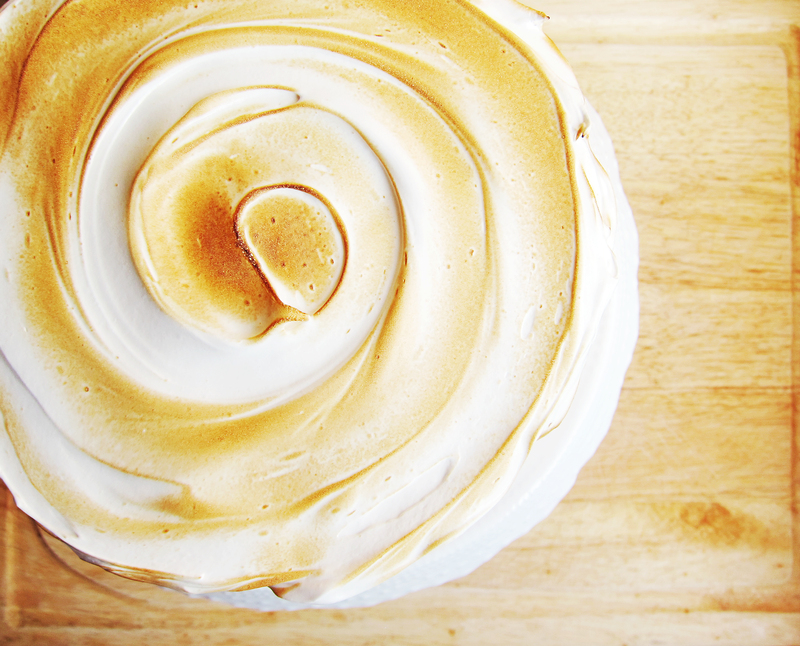 Toast the frosting with a torch (kitchen, butane, or propane your choice) until golden brown. Stand back and enjoy your work of art. Caramelized banana cake adapted from espresso and cream. Marshmallow frosting adapted from Martha Stewart. This entry was posted in Bread, Cakes, Caramel, Cheesecake, Desserts, Fruit and tagged banana, Cake, Caramel, cheesecake, dessert, marshmallow. Bookmark the permalink. This sounds truly sinful! What a gorgeous cake. And the flavors sound great. 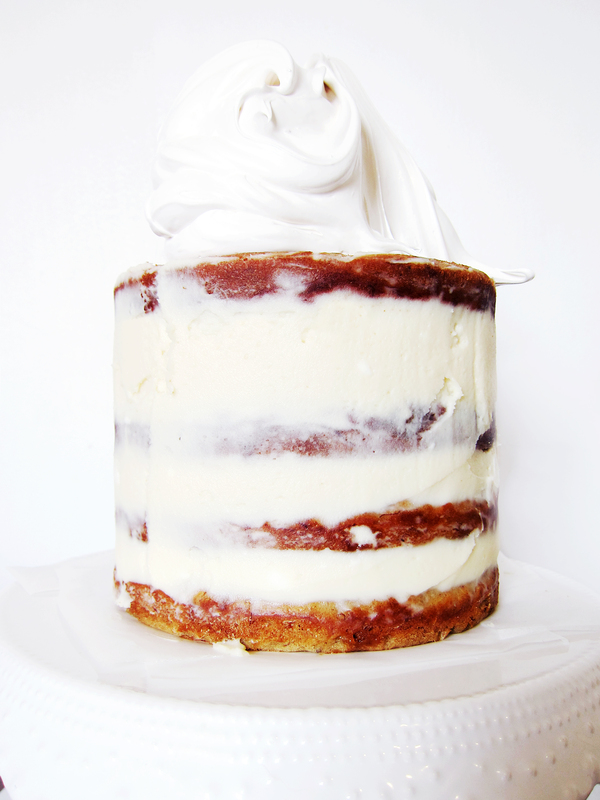 I love banana cake with cream cheese frosting, this could only be better! This looks terrific! So decadent and gorgeous—love it! Oh my god. I am salivating just reading that title, let alone the photos. 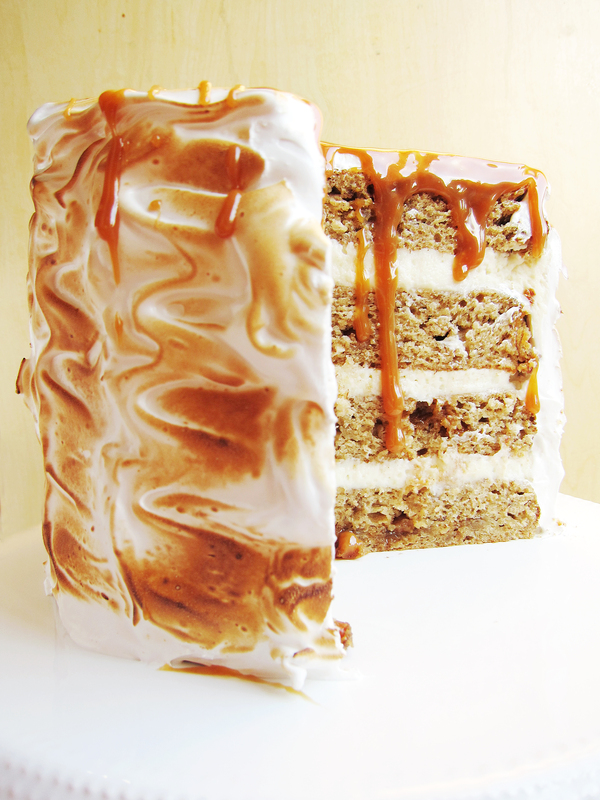 The caramelized banana cake sounds incredible, but adding all of that frosting / caramel / marshmallowy goodness? Wowowowow. Will at least have to try that banana cake, since it sounds so flavorful even on its own. Oh. My. God. Forget licking the screen, I nearly took a chunky bite out of my laptop while looking at these photos! Beautiful. Thank you, Susanne 🙂 Lol I’m glad your laptop is still intact! Oh heeeeey, brain twin! I love that we are on the same psychic wavelength. Your cake sounds amazing–I love the addition of caramelized bananas, cheesecake frosting, and caramel sauce! Clicked over here from Sugar Hero because I just had to see the twin cakes! 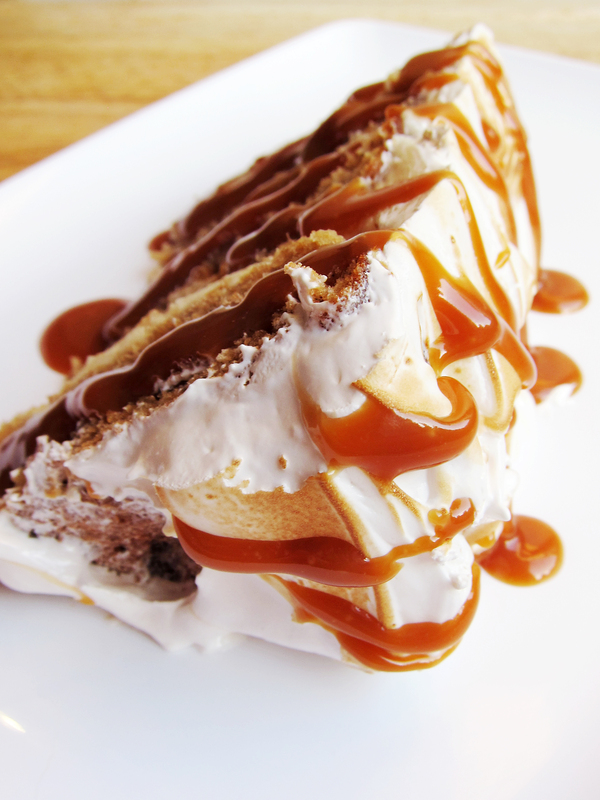 🙂 This is gorgeous and that caramel sauce is truly icing on da cake! Thank you for sharing the filling and icing sounds divine.